Douglas Fir Trees from the PNW produce the strongest lumber of all species grown for the best and affordable wood framed buildings. Not only is Douglas Fir stronger it is the most resistant to fire even when raw. Douglas fir is unique among all softwood species in that it is dimensionally stable without being dried, meaning that it does not shrink or twist significantly. Douglas Fir is widely distributed throughout the United States ever since the housing boom after WW2. Many stick framers prefer to nail and fasten it in the green wetter state which allows it to air dry during construction when it's vertical in walls. For the pre fab wall factories and now the mass timber CLT, Doug Fir can be dried in temperature and controlled kilns or even stacked on stickers that are air dried until its moisture content reaches the desired 19% or less so wall panel plants that desire lighter walls for easier mobility. 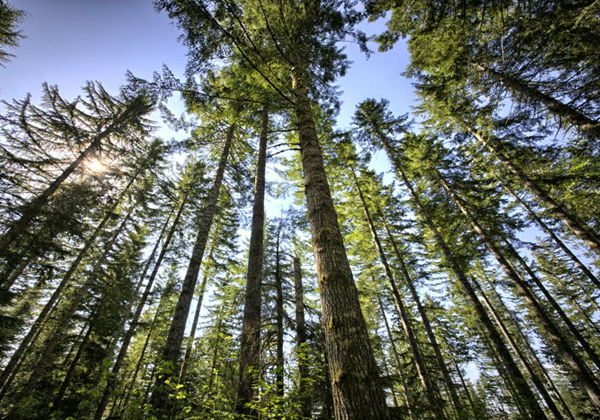 Douglas Fir is widely distributed throughout the United States ever since the housing boom after WW2. Lumber yards like Doug Fir inventories better because it does not twist like the white woods with lesser strength. Another benefit of fire in these Douglas-fir forest communities is that it kills fungus so we get better carbon sequestration. As natural forests age there may be an increase in root rot as fungi travel. In our Reforestation factory programs that grow trees faster than natural forests, the saplings are separated to eliminate the rot. The better Doug Fir forests are found where climates with precipitation exceeds 50 inches annually so our American Pacific NorthWest is the perfect location for its rapid growth. Our structural engineers like Douglas Fir best because it deliveres the best bending and lateral strength values. The Canadian Spruce can not be used in western regions and some of the North Eeast where seismic and lateral strength design values are higher then what Spruce Pine Fir can deliver. The best part about this new Canadian Tariff is it drives us back to our American Grown stronger lumber. Many of the early saw mill settlers in the Pacific North West showed up when the G.I bill housing boom started in Levittown after WW2. Now it's time for builders and designers to pay attention to the value engineering savings of using stronger lumber that does not cost more, even when its grown in the west and used in the North East.